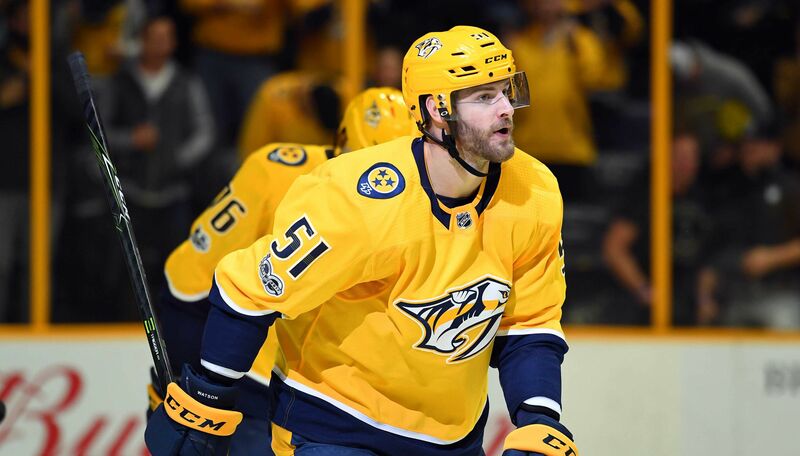 The NHL has suspended Austin Watson of the Nashville Predators for the first 27 games of the regular season without pay following his June arrest for domestic assault. Watson, who was official suspended for �unacceptable off-ice conduct,� will also miss the entirely of the preseason. In a short statement on the NHL website, the league announced that the suspension was being levied by NHL commissioner Gary Bettman under Rule 18-A of the Collective Bargaining Agreement. Watson�s arrest came after a June 16 incident in which police say he acknowledged having an argument with his girlfriend and pushing her. A witness also said they witnessed Watson �swat� his girlfriend and prevent her from leaving their car. On July 24, Watson pleaded no contest to a misdemeanor charge of domestic assault. Of the four major sports leagues in North America, the NHL is the only one that does not have a specific policy on domestic violence. Instead, each case is handled on a case-by-case basis by the commissioner�s office. The Predators issued a statement saying that the team supported the league�s investigation, and also emphasized the franchise�s support for AMEND, a program that helps teach men and boys how to end violence against women and children. The team also provided words of support for their player and his family. �During his suspension, we wish Austin, Jenn and their baby the best as they take the necessary steps to move forward, with the support of the Nashville Predators, the NHL, the NHLPA, and all the collective resources they can provide,� the Predators said in the statement. The NHLPA has said it is filing an appeal on Watson�s behalf. If the suspension is upheld in full, Watson will first be eligible to rejoin the Predators for their Dec. 3 game against the Buffalo Sabres. Because of the lack of a standardized policy, the rationale for decisions by the NHL in domestic violence cases can be difficult to discern. For instance, Slava Voynov is still facing an indefinite suspension for an incident that took place in 2014, with a hearing expected to take place with the commissioner in the near future. Austin Watson was selected by Nashvile in the first round of the 2010 NHL Entry Draft. After playing a handful of games in the 2012-13 season, the winger has been a regular in the Predators� lineup for the past three seasons. 2017-18 was his most productive season, as Watson scored 15 goals and added five assists in 76 games played. He also added five goals and three assists in the playoffs.